Originally released on Columbia as a home video on August 29, 1995, Mad Season: Live at The Moore will be available in a collectible 2LP 12" gatefold package with new liner notes penned by Mad Season drummer Barrett Martin especially for this 20th anniversary edition. The 2LP edition of Mad Season: Live at The Moore features live versions of "River Of Deceit," "Wake Up," a blistering cover of John Lennon's "I Don't Wanna Be A Soldier" and more. An alternative rock supergroup formed in 1994, Mad Season served as a creative side-project for singer Layne Staley (Alice in Chains), guitarist Mike McCready (Pearl Jam), drummer Barrett Martin (Screaming Trees) and bassist John Baker Saunders (Lamont Cranston Band). Mad Season wrote, recorded and released Above, the group's one and only studio album, in 1995. That seminal collection was quickly certified RIAA gold, becoming an essential touchstone in the history of Seattle grunge rock. 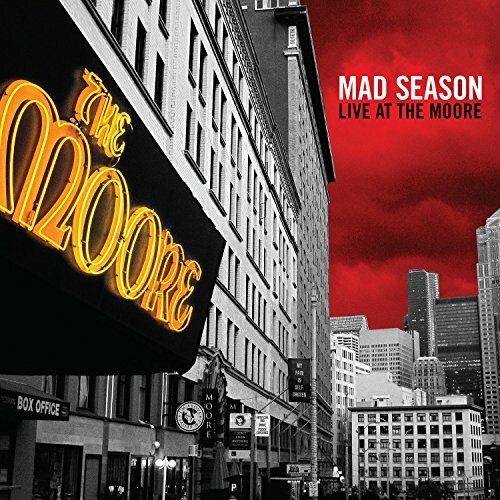 Mad Season: Live At The Moore showcases, on spellbinding audio across two 12" vinyl LPs, the band's historic final performance at The Moore Theatre in Seattle on April 29, 1995. Remastered in stereo sound for this 20th anniversary vinyl edition, Mad Season: Live at The Moore includes the full 11-song set, originally released in part on the 1995 VHS in 1995 and later expanded for release on CD and DVD as part of the deluxe reissue of Above in 2013. View More In Alternative Rock.